Missouri Soybean Merchandising Council Board Members Kyle Durham, Tim Gottman and Bob Littleton as well as Director of Business Development Tony Stafford joined the launch of ASA/WISHH’s newest strategic partnership. 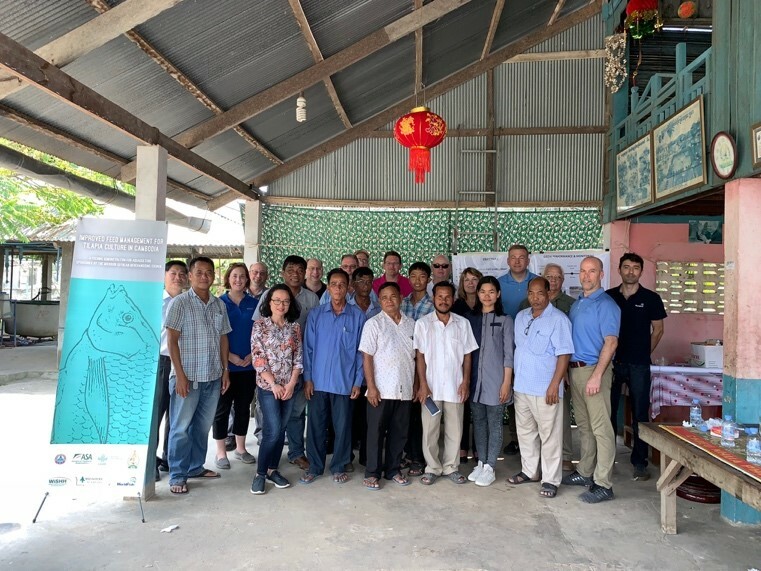 ASA/WISHH’s U.S. Department of Agriculture-funded Commercialization of Aquaculture for Sustainable Trade (CAST) – Cambodia project is designed to grow trade and development of Cambodia’s important aquaculture sector. The MSMC trade team joined Cambodian and U.S. officials at the CAST inaugural event on January 31 in Phnom Penh. The five-year CAST project makes it possible for Cambodia’s private sector and universities to work closely with U.S. soybean growers and businesses, as well as academic and non-governmental organizations. Cambodia’s Minister of Agriculture, Forestry and Fisheries Veng Sakhon and Chargé d’affaires of the U.S. Embassy in Cambodia Michael Newbill presided at the launch ceremony. His Excellency Veng Sakhon described how the project will strengthen value chain linkages from hatcheries to producers, buyers and distributors. WISHH’s CAST project benefits from the strategic expertise of key partners, including the U.S. Soybean Export Council (USSEC), Kansas State University, Auburn University, World Vision, and local universities in Cambodia. Importantly, Cambodia’s local private-sector feed mills and hatcheries and the Cambodian Ministry of Agriculture, Forestry and Fisheries are all collaborating with WISHH to implement CAST. The MSMC representatives toured Cambodia’s Center of Excellence on Sustainable Agricultural Intensification and Nutrition (CE SAIN) of Royal University of Agriculture, a fish hatchery, animal feed store and more. Cambodia’s GDP has increased by more than 7 percent per year since 2011, growing the demand for animal and aquaculture-sourced protein. CAST’s anticipated local economic impact exceeds $300 million over the life of the project, and Cambodia’s aquaculture industry demand for soybean protein is projected to reach 100,000 metric tons per year by 2030. While in Southeast Asia, the WISHH trade team also traveled to Myanmar, which is often called Burma, where WISHH is leading USDA-funded activities to grow the soy food market. The U.S. Soybean Export Council is also active in Myanmar’s animal feed and aquaculture sectors. ASA/WISHH connects trade and development. As a trailblazer for trade, WISHH grows markets for U.S. soy farmers, and at the same time, improves lives and economic opportunities in developing countries. WISHH works with international companies and organizations that purchase U.S. soy. These buyers invest thousands of their own dollars to research and promote soy-based foods and feeds made with U.S. soy in emerging markets. Over the last five years, WISHH leveraged soybean farmer checkoff investments by a ratio of more than 6-1.